SSgt. William R. Neil Jr. Hometown: Holmdel, New Jersey, U.S.
Died: March 22, 2008 in Operation Enduring Freedom. Unit: Army, 3rd Battalion, 3rd Special Forces Group, Fort Bragg, NC. Army Staff Sgt. Neil was assigned to the 3rd Battalion, 3rd Special Forces Group, Fort Bragg, North Carolina as a paratrooper. He died in Sperwan Ghar, Afghanistan, of wounds suffered when his vehicle encountered an improvised explosive device during combat operations. William graduated from Hudson Catholic High School in Jersey City, New Jersey. After graduating from high school, he served four years in the Navy and then gave up a five year career on Wall Street to enlist in the U.S. Army in 1998 as a supply specialist. His first duty assignment was with the 4th Ranger Training Battalion at Fort Benning, Georgia. 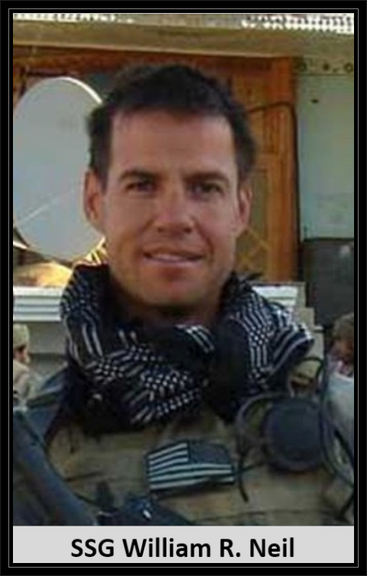 He passed the Special Forces qualification to become a Green Beret in 2006. 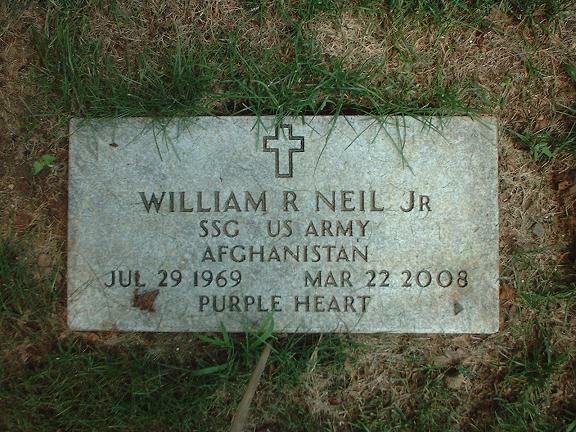 William was on his second deployment to Afghanistan when he was killed. 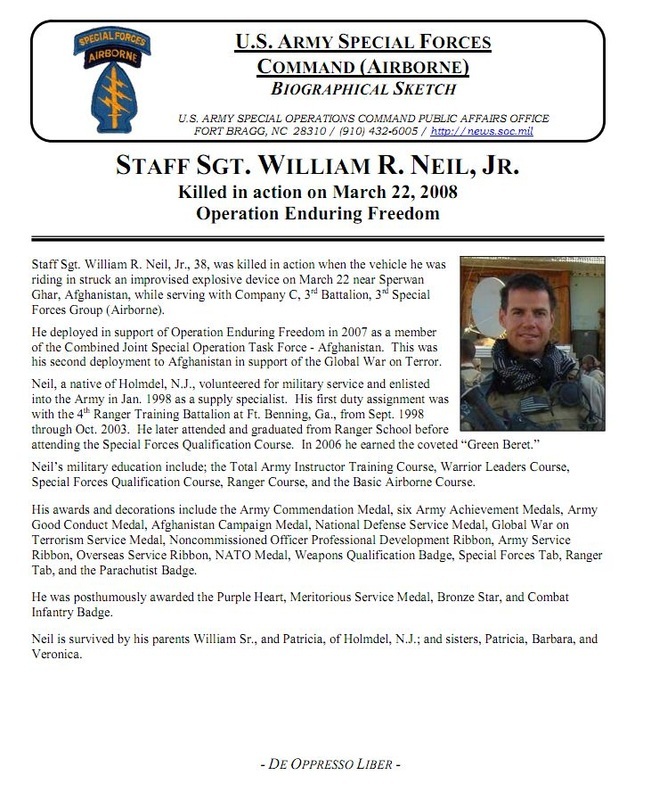 He received numerous awards and decorations which include the Army Commendation Medal, six Army Achievement Medals, Army Good Conduct Medal, Afghanistan Campaign Medal, National Defense Service Medal, Global War on Terrorism Medal, Noncommissioned Officer Professional Development Ribbon, Army Service Ribbon, Overseas Service Ribbon, NATO Medal, Weapons Qualification Badge, Special Forces Tab, Ranger Tab, and the Parachutist Badge. His parents were given their son's Bronze Star, Purple Heart and Meritorious Service medal in the Combat Infantry badge, posthumously. William was loyal, compassionate and dedicated to what he was doing. He was encouraging and helpful to anyone, friend or not and died doing what he loved – a true patriot. William was a kind and generous person who will never be forgotten.